Hero Arts clear stamps featuring flowers, "Sending well wishes your way", "Thanks for everything", and "Have a beautiful day". Hero Arts 4" x 6" clear stamp sets offer the best quality in the market. They are made in the USA from genuine photopolymer, which is non-toxic, biodegradable, and designed specifically to transfer ink to paper for a true impression every time. Peel off your stamp from its backing and stick to an acrylic block for easy positioning. Mix and match the designs, then clean with water or stamp cleaner. The sweetest of phrases all gathered together with some bonus embellishments for a delightful gathering of greetings. 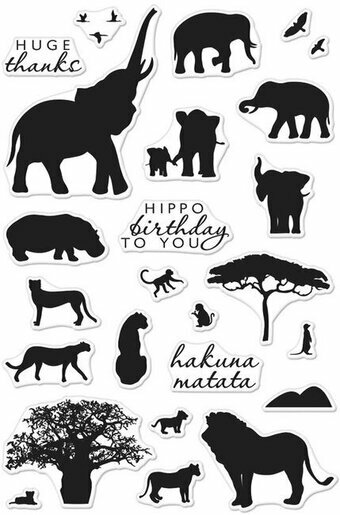 Includes clear stamps with the phrases "Happy Birthday", "My Friend", "To Cheer You", "Thoughts of you always put a smile on my face", "Wishing you a year full of hearty laughs, smiling faces and warm hugs", "Thank You", "This warm and friendly greeting is dropping by to say that you are fondly thought about and wished a Happy Day", Thinking of You", "Heartfelt and handmade by", "Wishing you the happiest birthday ever", and "A birthday should be happy, just perfect through and through, especially when the day belongs to someone as special as you". This Large 4" X 6" set of Perfectly Clear Stamps set features premium photopolymer images from exclusive Fran Seiford artwork. Interactive images work together for dozens of fun looks. Made in the USA. A beautiful, hand-lettered, brushstroke greeting set with 16 sentiments and four small icons. You'll reach for this set over and over. This Large 4" X 6" set of Perfectly Clear Stamps features premium photopolymer images from exclusive Fran Seiford artwork. Interactive images work together for dozens of fun looks. Use with acrylic handle sold separately. Made in the USA. Stamp set from Poppystamps featuring the sentiments "you are so thoughtful", "thank you", "you are the best", "to a good friend", "you are wonderful in every way", "thinking of you", "miss you", "hello", "you make me smile", "thank you". Penny Black clear stamp featuring butterflies and the sentiments "Thank You" and "With Love". Penny Black clear stamp featuring a teddy bear with flowers, and the sentiment "Thank You". Cling rubber stamp featuring flowers and the sentiments "Happy Birthday", "Hello", "Congratulations", "Thinking of You", "With Love", and "Thank You". These detailed stamps are the perfect way to add fun images to your cards, scrapbook pages and more! Use with any clear acrylic block. 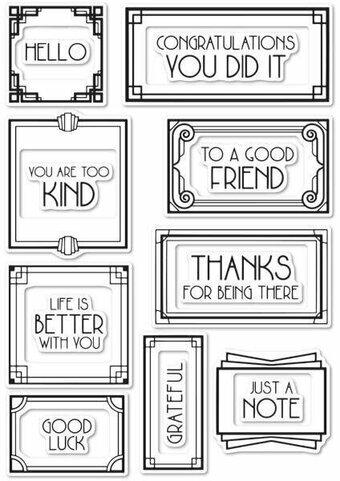 Clear stamps featuring the sentiments "Best Wishes", "Just a Note", "Miss You", "Thanks a Bunch", "You make me happy", "Thinking Of You", "Happy Birthday", and more. The versatility of the sentiments and the unique label style of this stamp set makes it a favorite among our customers. You can stamp them for a simple one-layer look, emboss them for texture and shine, or layer them to add an interesting dimension to your projects. This set is a perfect addition for any card maker or scrapbooker. This is a 4" x 6" stamp set containing 16 individual stamps made in the USA from high quality photopolymer. All of the label greetings are 3/8" wide and range from 1" to 3" in length. 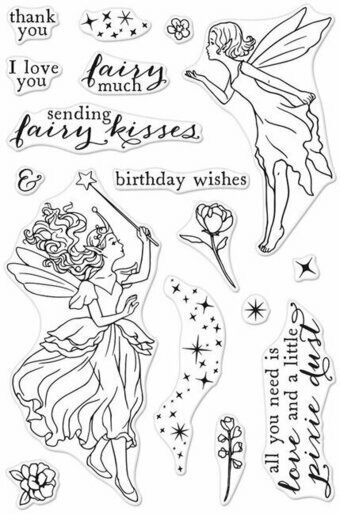 Hero Arts clear stamps featuring fairies and the sentiments "Thank You", "I Love You", "Birthday Wishes", and "All you need is love and a little pixie dust". Hero Arts 4" x 6" clear stamp sets offer the best quality in the market. They are made in the USA from genuine photopolymer, which is non-toxic, biodegradable, and designed specifically to transfer ink to paper for a true impression every time. Peel off your stamp from its backing and stick to an acrylic block for easy positioning. Mix and match the designs, then clean with water or stamp cleaner. Hero Arts clear stamps featuring the sentiments "Just For You", "Hello There", "Grateful", "Thinking of You", "Thank You", "Best Wishes", "Love You", "Miss You", and more. Hero Arts 3" x 4" clear stamp sets offer the best quality in the market. They are made in the USA from genuine photopolymer, which is non-toxic, biodegradable, and designed specifically to transfer ink to paper for a true impression every time. Peel off your stamp from its backing and stick to an acrylic block for easy positioning. Mix and match the designs, then clean with water or stamp cleaner. Cling stamp featuring the sentiment "Thank You". Deep Red stamps are made of a blend of natural rubber and are attached to a cling foam pad for better definition. Cling Stamps from Impression Obsession featuring the sentiments "Happy Birthday", "Just A Note", "Thinking Of You", "Happy Holidays", "Thank You", and "Merry Christmas". 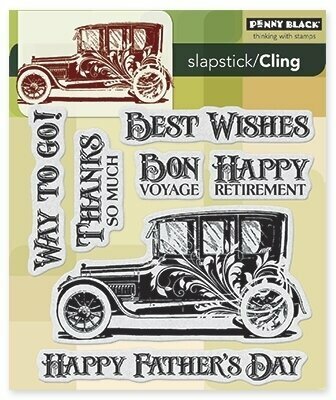 Penny Black slapstick cling stamps featuring an antique automobile, "Best Wishes", "Bon Voyage", "Happy Retirement", "Way To Go", "Thanks So Much", and "Happy Father's Day". This clear stamp clings to our uniquely designed acrylic mini block--no adhesive necessary. 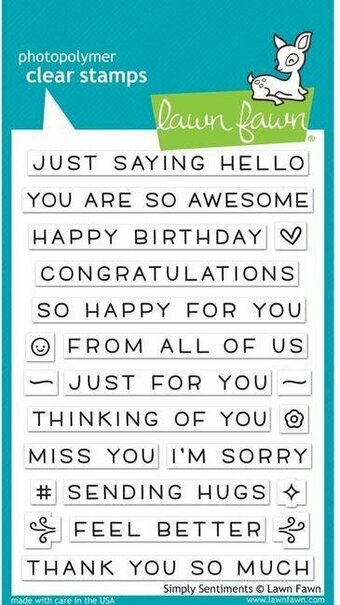 Create fun mini greetings for friends! Penny Black clear stamp featuring the sentiments "Every day is a new day to say I love you", "Thank you for making my day", "Grateful because we share the priceless love of family", "Grateful you are such a great friend", and more. 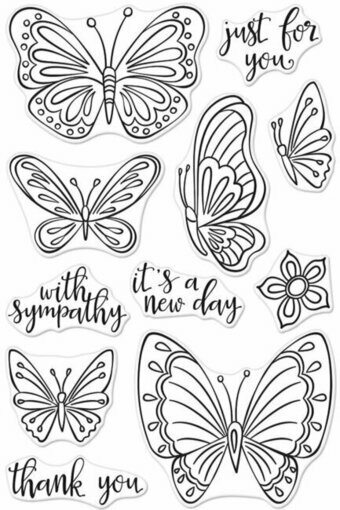 Hero Arts clear stamps featuring Butterflies and the sentiments "Just For You", "With Sympathy", "Thank You", and "It's a New Day". Hero Arts 4" x 6" clear stamp sets offer the best quality in the market. They are made in the USA from genuine photopolymer, which is non-toxic, biodegradable, and designed specifically to transfer ink to paper for a true impression every time. Peel off your stamp from its backing and stick to an acrylic block for easy positioning. Mix and match the designs, then clean with water or stamp cleaner. Christmas themed clear stamps from Lawn Fawn featuring a latte, "You're the cream to my coffee", "Warm wishes", and more. 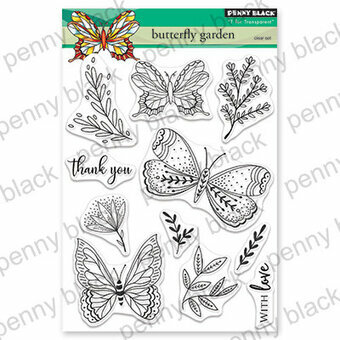 Penny Black clear stamps featuring flowers, and the sentiment "Heartfelt Thanks". Impression Obsession clear stamps featuring flowers, "Just Because", "Thanks a Bunch", "Hello Spring", and "For You". This is a clear photopolymer stamp set measuring 4 x 6 inches. Our clear stamps are made in the USA from the highest quality photopolymer. Penny Black clear stamp featuring flowers, "Thanks", and "Hello". 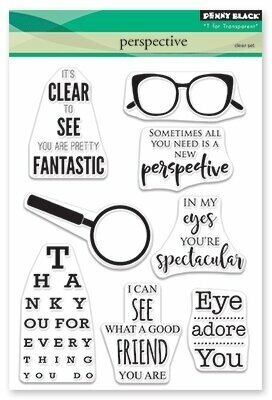 Find your perfect sentiment with this versatile set of clear stamps. 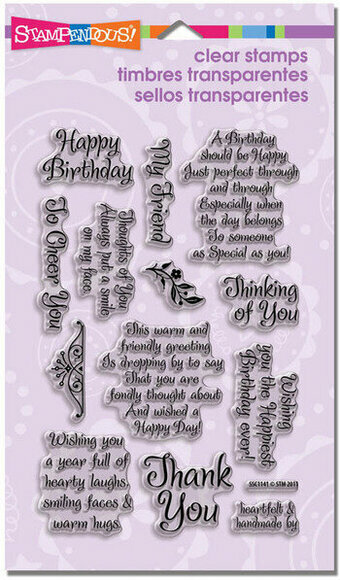 These sentiments work with just about any style of card! Includes "Thinking of You", "I'm Sorry", "Miss You", "Feel Better", "Sending Hugs", and more. 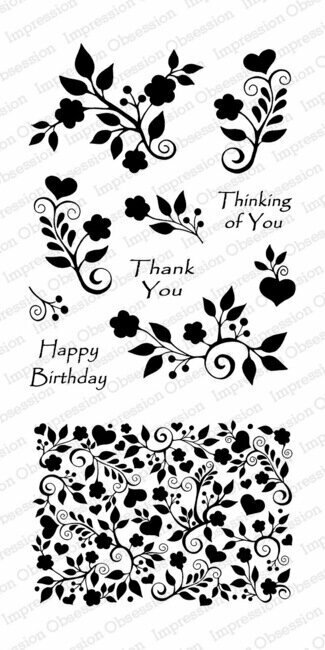 Impression Obsession clear stamps featuring a background of flowers, "Thinking of You", "Thank You", and "Happy Birthday". This is a clear photopolymer stamp set measuring 4 x 8 inches. Our clear stamps are made in the USA from the highest quality photopolymer. Our Cool Beans stamp set will give that coffee lover a pick-me-up with it's fun sentiments and coffee cup image. 15 total stamps. Coffee cup measures: 1 1/2" x 2 1/16"; I love you a latte sentiment measures: 13/16" x 7/8"; cool beans sentiment measures: 7/8" x 9/16". Our Exclusive clear stamps are proudly made in the USA. 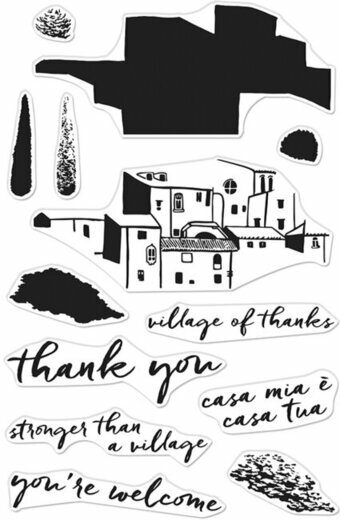 Penny Black clear stamps featuring flowers, berries, and the sentiment "So Many Thanks". Cling rubber stamps featuring the sentiments "Thinking of You", "Hugs", "With Sympathy", "Thank You", "Hello", "Congratulations", "Get Well Soon", and "Happy Birthday". These detailed stamps are the perfect way to add fun images to your cards, scrapbook pages and more! Use with any clear acrylic block. Hero Arts clear design stamps peel off their backing and stick to acrylic blocks for easy positioning. Mix and match the designs, then easily store them for another time. Made in the USA from genuine photopolymer, which is non-toxic, biodegradable, and designed specifically to transfer ink to paper for a true impression every time. You'll have a bushel of fun crafting with this set of clear stamps! This set is great for teacher cards, fall cards, or thank you cards. Stamp your favorite smiley faces onto the apples, or leave them plain and pair them with a cute sentiment. Approximate stamp sizes: [apples and basket] 1 3/5" x 1 7/8", [apple] 3/5" x 3/5". 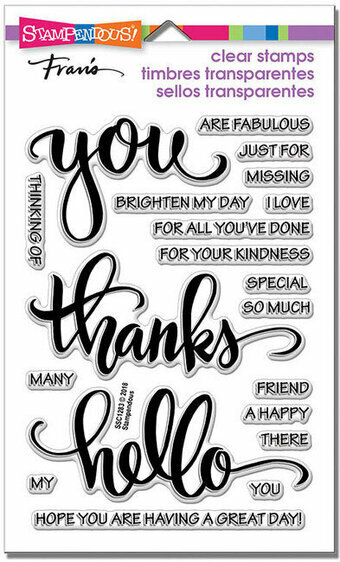 Clear stamps featuring the sentiments "I'm so thankful for all you do", "Thankful for you", and "Thankful to have you in my life". This is a clear photopolymer stamp set measuring 3 x 4 inches. Impression Obsession clear stamps are made in the USA from the highest quality photopolymer. Clear stamps featuring the sentiments "Get Well Soon", "Thank You", "Sending Love", "Hello", "To", and "From". Hero Arts clear design stamps peel off their backing and stick to acrylic blocks for easy positioning. Mix and match the designs, then easily store them for another time. Made by us in the USA from genuine photopolymer. Unmatched quality means a crisp impression every time. 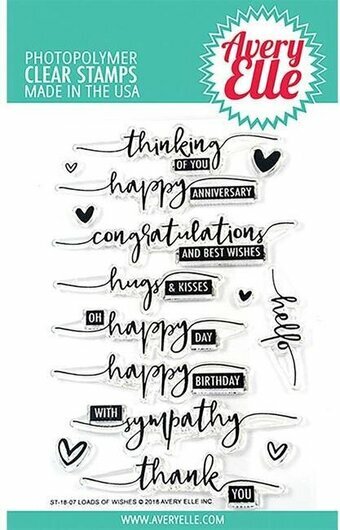 This clear stamp set features sentiments "Birthday", "Hello", "Thinking of You", "Grateful", and more. Impression Obsession clear stamps are made in the USA from the highest quality photopolymer. 4" x 6" set. This clear stamp set features a large dressed turkey, turkey with classic disguise glasses, overstuffed cat, dog and mouse, row of leaves, pumpkin pie slice, wishbone, and sentiments "Wishing you a Happy Thanksgiving" "How I feel after Thanksgiving" "Happy turkey day!" "So FULL... of Thanks" "Ate too much" "It's Thanksgiving! Time to dress the turkey" Set of 9 clear stamps. 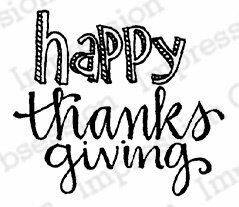 Impression Obsession cling stamp featuring the sentiment "happy Thanksgiving". A 4"x6" set of clear stamps, made of the highest quality, non-yellowing polymer. Our clear stamps are proudly made in the USA. 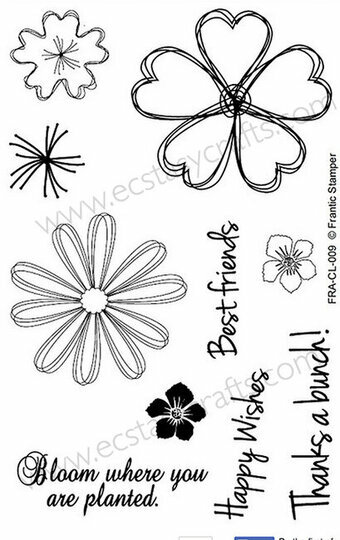 This set includes 10 clear stamps (including 4 fun greetings and 6 scribbly flowers). Use this clear stamp set alone, or combine with the Frantic Stamper Precision Die set: "Medium Layering Posies" (FRA9556). The die set will cut 3 of the flower stamps perfectly leaving a slight white border. Three, large, bold, beautiful, script words join a versatile array of 16 smaller words to create the most popular phrases for cards and mixed media projects. Overlap them, tile them, use them for backgrounds or focal points. So versatile!! 19 stamps. This Large 4" X 6" set of Perfectly Clear Stamps features premium photopolymer images from exclusive Fran Seiford artwork. Interactive images work together for dozens of fun looks. Use with acrylic handle sold separately. Made in the USA. 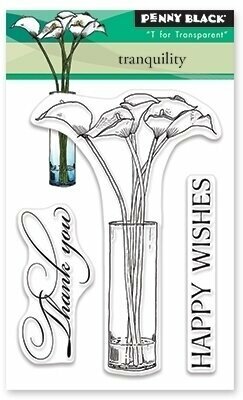 Penny Black clear stamp featuring flowers, vases, "Thank You", and "With Love". Clear stamp set featuring sloth in a coffee cup, sloth hanging from tree with balloon, sloth hugging a heart balloon, sloth with "Thanks" banner, and sentiments "I love you a whole sloth" "Slow down Enjoy your day!" "Have a slothsome birthday" "Thanks a sloth!" 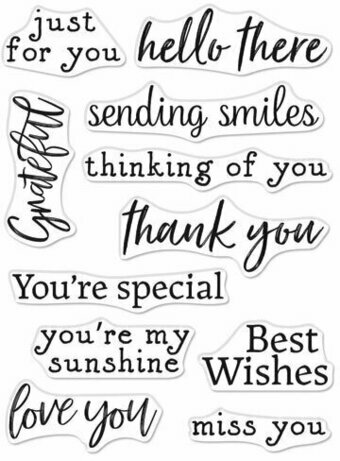 "I love you slow much"
Clear stamps featuring the sentiments "Hello Friend", "Thinking of You", "Thank You", "Thanks", "Grateful", "Congrats", "On Your New Job", and more. Clear stamps featuring flowers and the sentiments "Handmade By", "Just For You", "Thanks", and "Best Wishes".